My friend S. had a migraine for something like 2 days this past week. 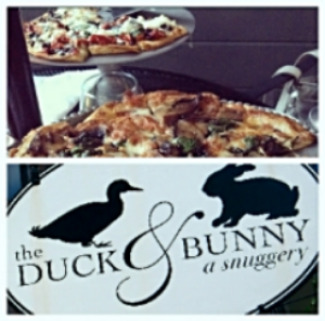 I had no idea – until we sat down at the Duck and Bunny last night and she told me all about it. At that point, I did feel guilty – for a second or 2 – for even suggesting we go out, but then, I thought the atmosphere (Love the vintage-y and kitschy aesthetic there.) and the food (It’s good, good and GOOD!) might make her forget about it. Yup, I can be selfish sometimes. Of course, she wanted to sit outside in their garden. Unlike me, she’s very much into gardening, nature and anything outdoorsy. (She also thinks I’m going kayaking with her soon. Don’t tell her, but I am so NOT.) It actually ended up working out well though because it wasn’t too hot or too cold out. It was just nice, more like September nice than August nice, which is just fine with me. I love September weather! Guess I wasn’t being so selfish after all. Wink face.